I’ve always liked the Ferrari California. Why? For one, it drives like a Ferrari. Seriously: it’s small, it’s quick and the handling and suspension are tuned precisely as you’d expect from a Ferrari, which is to say that it’s a lot like a Lamborghini or a Porsche but you believe it’s way better because it has a Ferrari badge. It also sounds like a Ferrari. Even with the stock exhaust, jamming the throttle on the California unleashes exactly the sound you want from Italy’s finest. This seems counterintuitive considering the California is a front-engined four-seater, but it’s true. For proof, just ask a California driver to rev the engine at a traffic light, presuming you can get her to stop applying makeup. And then there’s the styling. You’ll note I didn’t say I love the California. I don’t mind the styling too much, save for the rear end. It’s way to big and it’s separated into levels as if it were a condo complex. But the worst part is by far the brake lights. You see, Ferrari designed the car with the idea of making brake lights out of the circles. But somewhere along the way, Ferrari North America reminded them that brake lights, by federal law, cannot be on a movable body part. Since the circles are mounted on the rear decklid, they wouldn’t work. This sent Ferrari scrambling back to the drawing board, which was probably an actual drawing board, where they came up with the idea you see in the attached photo. Yes, that’s right: the circles don’t light up. Instead, the tiny little lights right above the exhaust light up. They’re not LED, their brightness varies widely (in the photo, the left one is brighter) and because they’re not the circles, people always think the California’s brake lights are out. They’re not. It’s just bad design on an otherwise likeable – and not lovable – car. I would love to see a proper coupe version of the California. Hard top verts don’t do it for me. This is exactly what I always thought. The front end is attractive, and the overall long hood proportions of the car are perfect. A hatch like sloped roof like a 599 would have been perfect. And I knew the back end was ugly, but the first time I was behind one in traffic I was blown away by just how bad it looks. It also seems like almost a safety issue. The brake lights are nearly invisible when off due to the black tint, my eyes are glued to the round lights atop the fenders. Totally agree. The funny thing is that Audi actually got around this requirement – the Q7 and Q5 also have brake lights on a movable part (the tailgate). BUT when the tailgate opens the brake lights suddenly jump to pieces they have in the bumper. Ferrari could’ve done the same but I bet the engineering cost wasn’t worth it. Agree with your impressions of the California, fairly nice front end, horrible rear end. Anyway, for the past few days i’ve been thinking about a trend where manufacturers are placing brake lights/reverse lights separate from the cluster of the traditional corner lights/interior brake light. 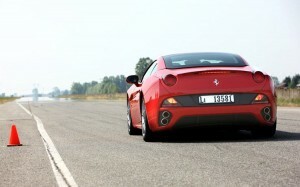 On cars such as the Ferrari F12, Nissan 350z. Chevrolet Orlando (I live in Canada) and Mercedes SLS-AMG, the break light reminds me of a Formula 1-style light on both premium and non premium brands. Wha?! 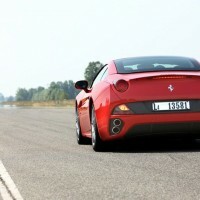 I always assumed those circles WERE the brake lights… I’ve never been lucky enough to actually SEE a Ferrari California. That’s a FAIL in so many ways. Pretty bad, huh? Yes: the brake lights are the tiny ones below. Very poorly designed indeed. Wow so I never knew that, and I live right near the Ferrari dealer and I have seen lots of these driving around, never noticed them stopping though. What a dumb design. But to you this is a small Ferrari??? It looks massive, from all angles, most of all the interior. The dash is so high it reminds me of an SUV, it is clearly based on the Maserati, and pretty much looks like the Maser too. By far my least favorite Ferrari, even my wife saw it and said “Ewww”, then went right to the 458 that was fully race prepped with carbon fiber everything and black wheels. Yes, that is why I married her. It’s not that big! 179.6 inches places it only an inch longer than the 458, but well over a FOOT shorter than the enormous FF. Looks massive, I agree, but it feels surprisingly svelte on the roads. As for the least favorite Ferrari remark – that’s obviously true. But “least favorite Ferrari” is hardly a criticism! Doug – thanks for writing this up! This is something that has annoyed me since the first time I was behind a moving California. I simply couldn’t believe that Ferrari would bungle the brake lights like that. The smoked enclosure makes me think more of a late-era V6 Fiero (which was possibly an aftermarket add-on, but I can’t remember) than Ferrari…for shame! Totally agree. It’s so bizarre that this is how it went down, but it is. Hopefully they learn from the mistake on the redesign. Why not just allow the “proper” Ferrari round brake lights to work in addition to the tiny “legal” ones just above the pavement? Seems a win for everyone…especially Ferrari design.